Gion Festival, which is possibly the most famous summer event in Japan as explained in “Japan’s Biggest Festival“, is coming soon. Gion Festival was started to pray for eliminating an epidemic that scared many people in Japan in 869. It’s a very historical and cultural event which locals and visitors look forward to experiencing every summer. There are many events in Gion Festival throughout July. So for those who are coming to Kyoto in July please check the following events. Note that some of these events are not open to the public. With Kippu Iri, the Gion Festival starts. Every town which participates in the festival has meetings to discuss this year’s processes. People belonging to Naginata Hoko Machi (district) gather and pray at Yasaka Shrine with a Chigo and two Kamuro. These are children chosen to lead the festival, serving as substitutes for God. At Kyoto City Hall, the lottery to decide the order of the Yamaboko Jyungyo (Floating Parade) is conducted. 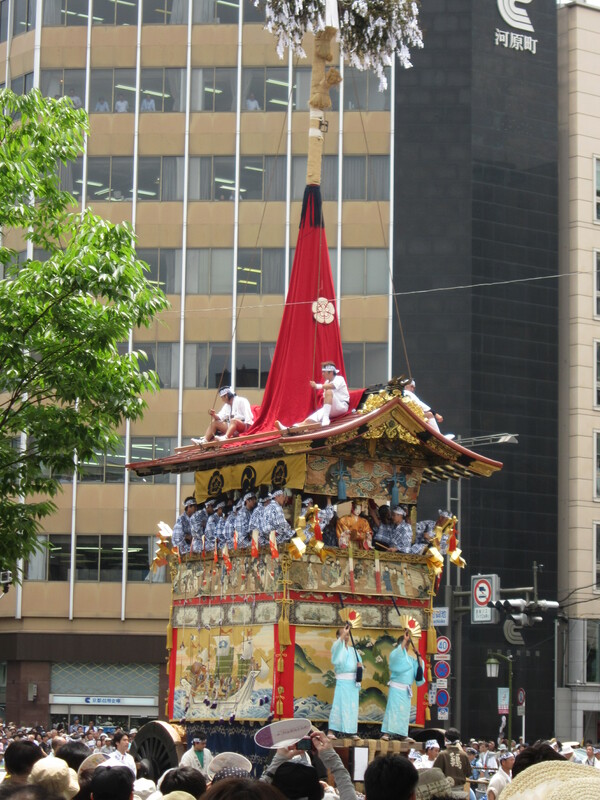 The Chigo will perform a traditional dance in front of the spot where the Naginata Hoko float is preserved. Each town that owns a Yamaboko float starts building their float. Volunteers march around the area near Yasaka Shrine with lanterns to welcome portable shrines that are carried to purify the night on the same day. One of three portable shrines is carried to Kamogawa River and purified for the festival. For people who are interested to watch, go to Shijo Bridge. Each “Float” town starts pulling their float inside the area. A Chigo from the Naginata Hoko visits Yasaka Shrine riding on a horse and receives a special rank. Two Kuzekomagata Chigos who have a role to lead the Kankosai (an event to carry portable shrines to special rest spots) and the Shinkosai (an event to carry back the portable shrines to Yasaka Shrine) visit Yasaka Shrine. Houses in the “Float” town remove the grates from the windows and display their valuable folding screens. Nagae House, which is specified as a tangible cultural building, opens its architecture and valuable goods including folding screens. 700 yen entry fee is required. This is one of the main events in Gion Festival. The floats are decorated and illuminated at night. Kids are playing traditional instruments. At Yoiyama, many people enjoy walking and visiting floats and numerous food stands are lined up along the streets. 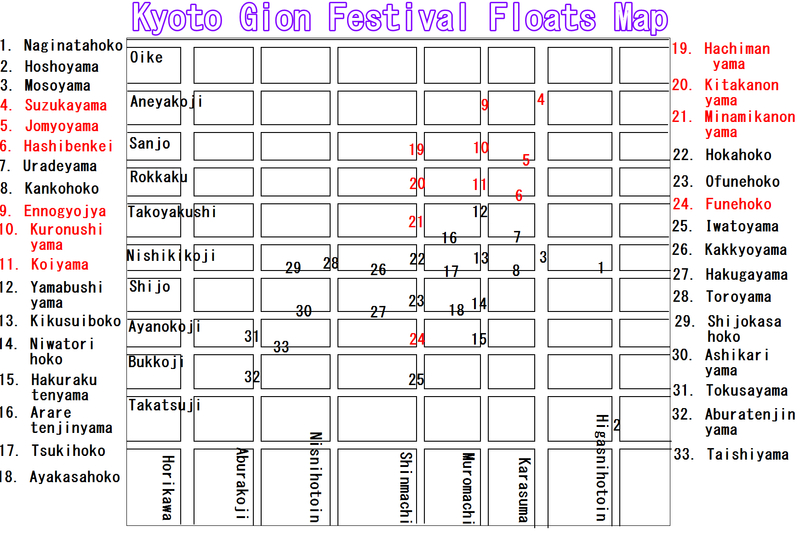 Note: The floats in red are the ones for posterior festival. At Yasaka Shrine, the spirits of the Gods are moved to three purified portable shrines with all the light off. Instruments players from the “Float” towns visit “the rest stops” of the portable shrines or Yasaka Shrine and pray that the next day will be sunny for the float parade. A network of people from Shimane prefecture dedicate a Shinto dance performance to Yasaka Shrine. At Yoiyama night, Shijo Street near Yasaka Shrine sets a stage for various performances including traditional dance by Maikos/Geikos and Japanese “Taiko” drum performance. 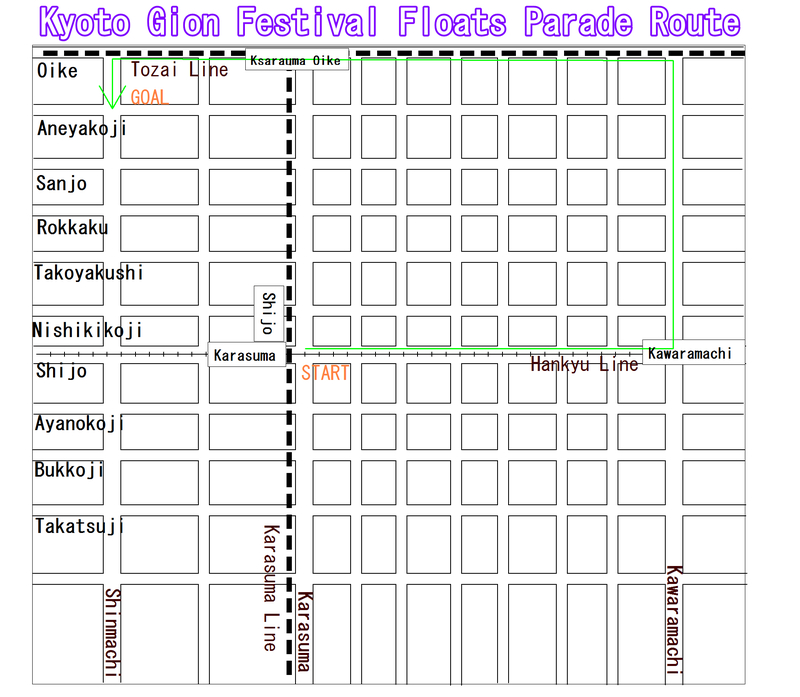 At 9:00 AM, 32 Floats led by Naginatahoko Float parade the street in central Kyoto area. 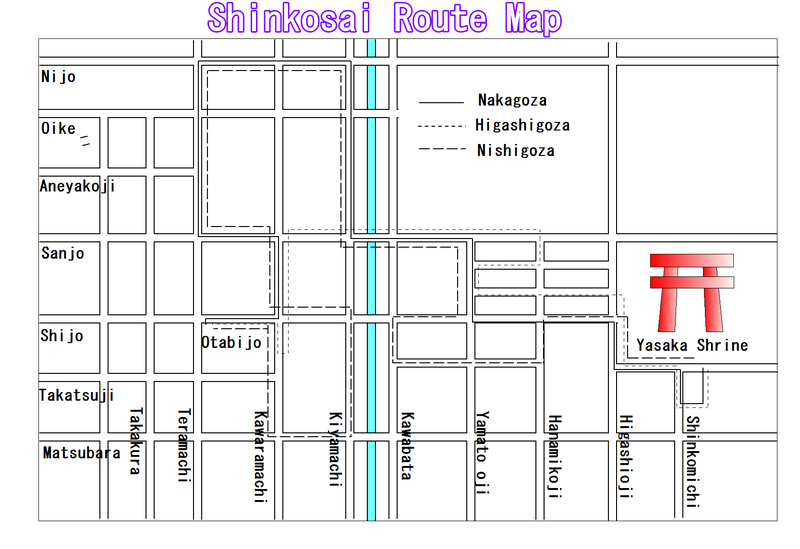 Check out the following map for the route. From Yasaka Shrine, the three portable shrines are moved to the rest spot. For the route, check out the map below. This is one of the main events in Gion Festival. The floats are decorated and illuminated at night. Kids are playing traditional instruments. At Yoiyama, many people enjoy walking and visiting floats and numerous food stands are lined up along the streets. However, the scale for the Posterior Festival is much smaller than that of the Anterior Festival. 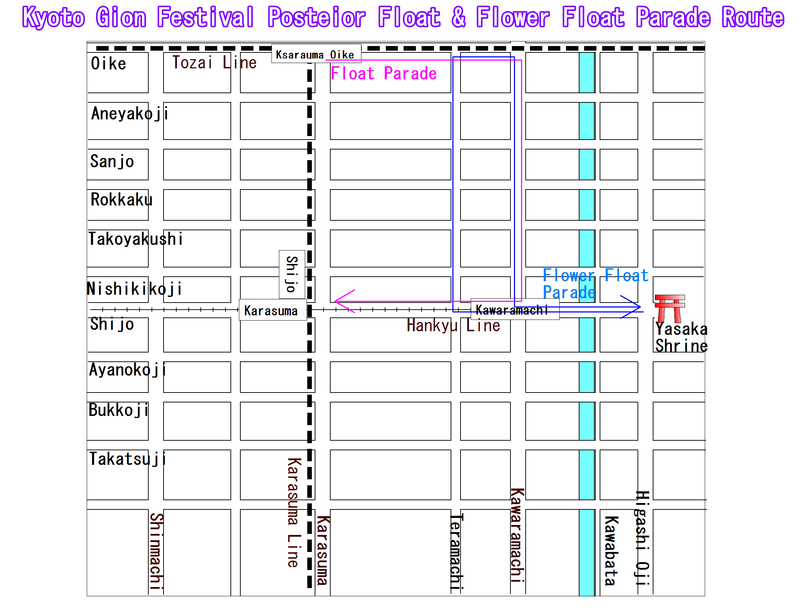 At 9:00 AM, 10 Floats led by Hashibenkeiyama parade the street in central Kyoto area. The Floats that this event use reflect the original forms of the Floats. As for the Floats, they are much smaller than the regular Floats, but people who walk with the Floats wear more colorful costumes. Maikos/Geikos join the parade as well. The three purified portable shrines that are stored at the rest spots for the Shinkosai Festival are carried and moved back to Yasaka Shrine. To purify the portable shrines now back at Yasaka Shrine, water is scooped up from the Kamogawa River. At Yasaka Shrine, there is a meeting to report that the events which make up the Gion Festival were conducted without any problems. This might not be open to public. A big grass ring is set up in front of a Torii Gate of Eki Shrine (inside Yasaka Shrine) following the legend that one of the most important Gods, Susanoo-no-Mikoto left a message that Somin Shorai, who became a deity of Eki Shrine, would eliminate the epidemic because he respected Susanoo-no-Mikoto. Visitors go through this ring to be purified and receive the talisman which mentions that they are descendants of Somin Shorai. This is the grand finale of the Gion Festival. For more fun and useful information, which will make your Kyoto Travel more memorable, exciting and stress-free, check our Kyoto e-Guidebook.